The Messages panel showing a set of DRC violations for the current PCB. The Messages panel is a centralized listing area for the warnings, errors and status messages that are generated by operations such as compiling a project, running a design rule check, releasing a project, or using any other message-enabled features of the software. To open the Messages panel, click the Messages button in the System group under the View tab: View | System | . The Messages panel provides a live stream of relevant message that pertain to the current operation. Where applicable, the lower section of the panel will provide further detail about the offending object(s) associated with the currently selected message. Messages are automatically cleared (but not necessarily resolved) when a new operation that generates messages is activated. The panel provides further details for each message class generated by the Compiler. 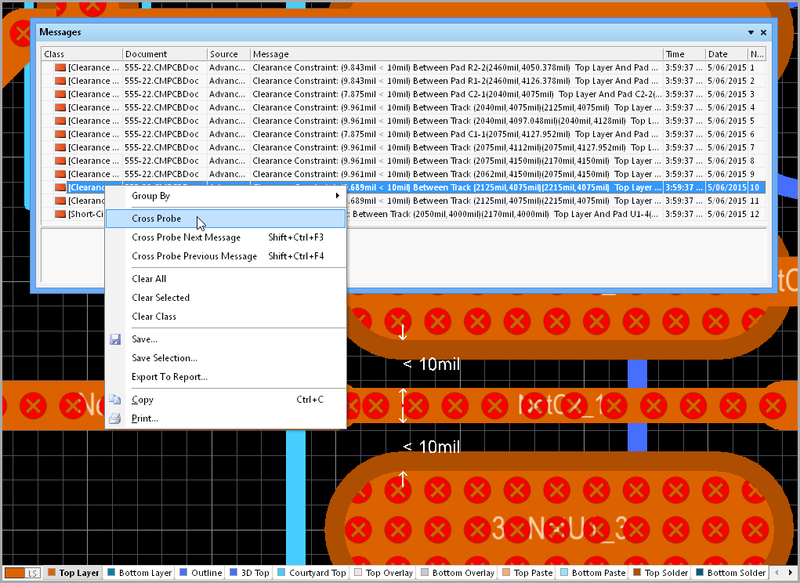 Primarily, the Messages panel is used to report the results of project compilation, listing any warnings and/or errors that the Compiler may have found whilst interrogating the design for electrical and drafting integrity. In this case, the individual messages in the panel will be directly affected by the error reporting levels and/or connection matrix defined in the Options for Project dialog. The error reporting levels for message classes is configured in the Error Reporting tab of the Options for.. dialog, opened with the Project Options button in the Content group under the main menu Project tab. This is Project | Content | in the Schematic editor, or Project | Content | in the PCB editor. The error reporting levels defined in the Options for Project dialog will be reflected in the Message panel content. See Project Options for more information on defining error messages in the Options for Project dialog. Document – The source document where the cause of the warning/error/violation resides. Source – The server or engine that performed the task when the warning/error/violation was encountered (for example, the Compiler). Message – the actual message itself. Each message is also date and time stamped and given a specific number within the list of messages that may appear. Where applicable, a message can be cross-probed to the offending object(s) on the affected document. Cross probing takes the current view directly to the object on the associated document, or indirectly, depending on the particular source of the message. The offending object(s) will be automatically zoomed and centered (where possible) in the design editor window. To cross probe from a message of interest, such as a Compiler error, right-click on the message and select Cross Probe from the associated context menu. Compiling the source schematic documents of a PCB project may create violation messages with the Source field entry of Compiler. 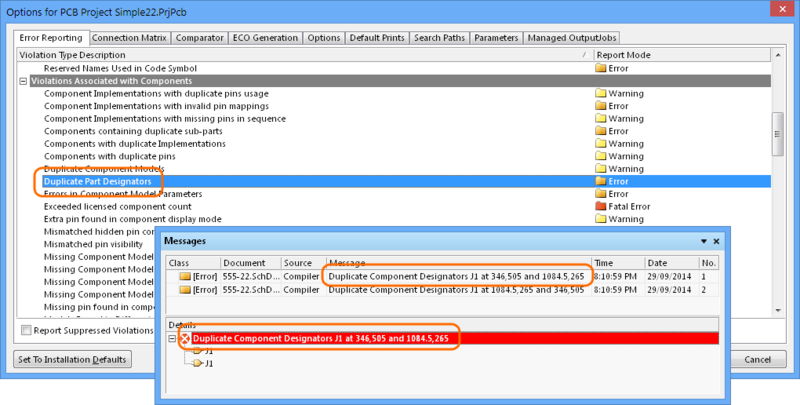 Launching the cross probe command will probe directly to the offending object(s) on the relevant document in the design editor window – in the case shown below, a duplicate designator error. Cross-probing from a schemtic Compiler error message. The document will be made active if it is not already, or unhidden and made active if it was previously in hidden mode. In a similar way, cross-probing from DRC error message in the panel will probe directly to the offending object on the associated document – in the below case, a PCB width rule violation. Cross-probing from a Clearance rule DRC message. When cross-probing to a PCB document, ensure that the relative PCB document is the active document in the design editor window – otherwise cross probing will occur, but the view will not jump to the document. Group By – Group messages together by source, class or document. 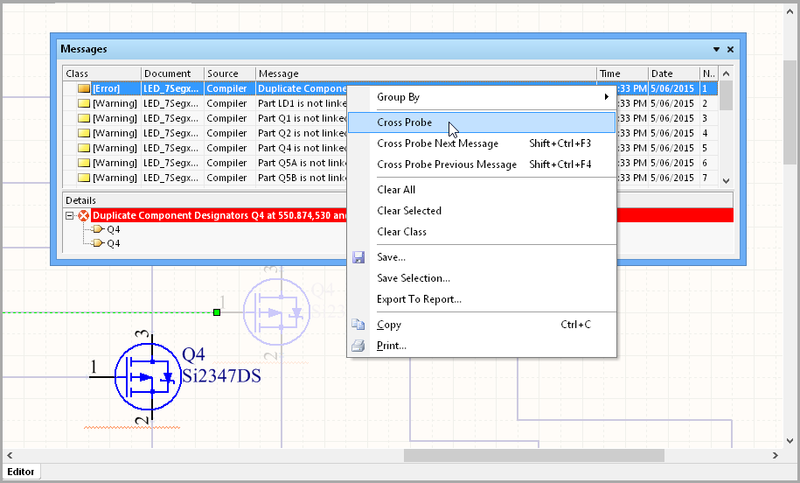 Cross Probe – Cross probe from the selected message in the panel to the object responsible for the message in the associated document. Cross Probe Next Message – Cross probe to the next reported message - navigate using the Ctrl+Shift+F3 keyboard shortcut. Cross Probe Previous Message – Cross probe to the previous reported message - navigate using the Ctrl+Shift+F4 keyboard shortcut. Clear All – Clear all messages that are currently displayed in the panel. Clear Selected – Clear all selected messages from the panel. Clear Class – Clear all messages from the panel that are of the same class as the currently selected message. Save – Save the current list of messages in the panel to file. After launching the command, the Save Message List To File dialog appears. Use this dialog to browse to a particular destination in which to save the file and to give the file a new name (if required). Save Selection – Save selected messages in the panel to file. After launching the command, the Save Message List To File dialog appears. Use this dialog to browse to a particular destination in which to save the file and to give the file a new name (if required). Copy – Copy the selected messages to the Windows clipboard. Print – Preview and print a report containing all messages currently listed in the panel. Not all messages can be cross probed. You can only cross probe from a message if it has a valid (existing) associated document, specified in the Document field of the message. Clearing messages does not necessarily mean the messages have been resolved. The same unresolved messages will be listed after performing the same command that led to the messages being generated initially. Message clearance is a visual aid when resolving errors in the design, allowing you to manually remove messages as you feel they have been resolved. The instigating command must be launched again to obtain an up-to-date picture of any violations that still exist.